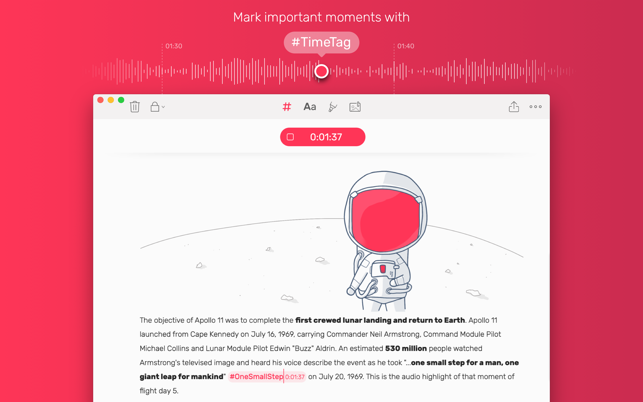 Bring your notes and audio together with Noted. Take your lectures and seminars to the next level. By tagging specific moments you can come back and fill in any blanks later - you'll never miss an important point from your professor again. When revising, there’s no need to listen back through hours of recordings. Your tags let you skip to the right moment instantly. 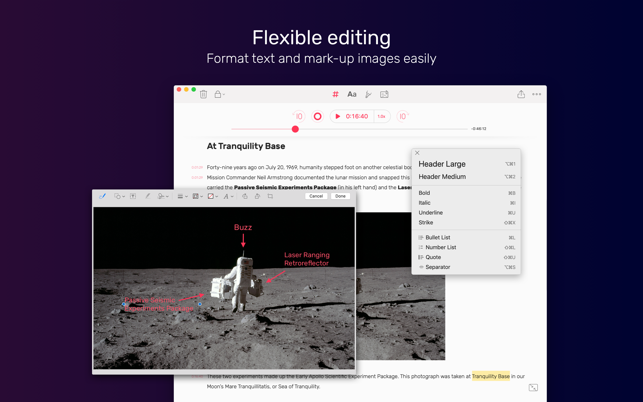 Keep it simple with all the core features including full editing, indexing and exporting across 5 notes. 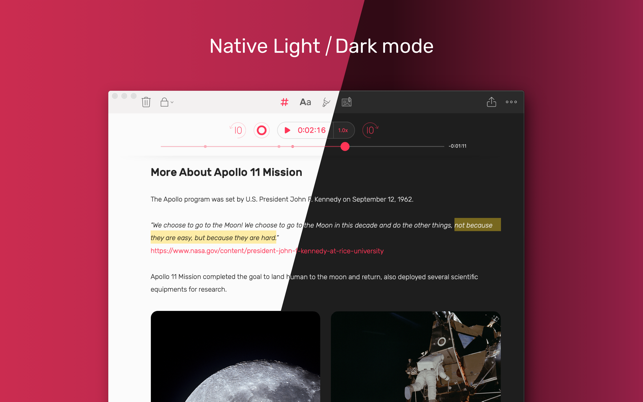 Noted 1.0.9 adds support for the Russian language. Spreading a warm welcome to passengers flying with us beyond limits! - Fixed PDFs not exporting for notes with line separators. I would say that this is the foundation of a fantastic app that has a lot of promise. The interface is great and the features that it does have are well executed. 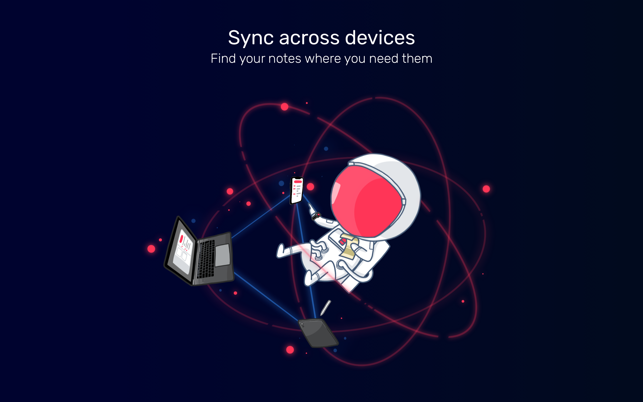 I was looking for an app that handles note-taking and audio recording, and Noted serves both of those functions well. My issue has to do with the walled ecosystem that a tool like this creates. People like myself jump from tool to tool and want to be able to export and move our data around. 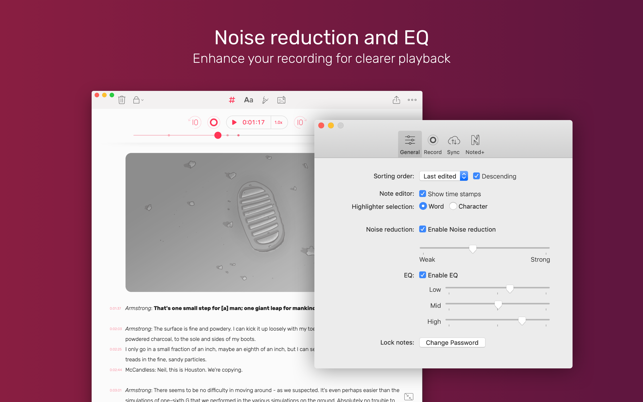 For me, I use Bear as my primary note repository, and wanted to use Noted as a way to take notes during meetings while recording the audio. Again, it does do that exceedingly well. However, if I wanted to move a note from Noted into Bear (or Evernote, or any other "digital bucket" type app), you quickly run into limitations. You can copy/paste text but a lot of the formatting gets lost. That's why I prefer to type in Markdown, which Noted doesn't handle. You can pull audio out easily enough, but better handling of the text is what I need. Excited to follow this app's development! 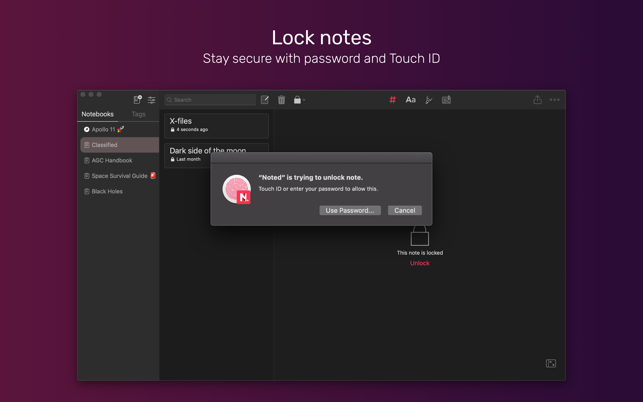 The April 18, 2019, release removed full access to Noted . I signed up for the yearly promo subscription when Noted was first realeased, and now I cannot access the full version of the app. When I click "restore purchase" I recieve a message that reads, Your purchase is being restored. Please wait. I have waited for close to an hour. Nothing happens. I have uninstalled and re-installed, but nothing happens. Please help. Hello! Sorry to hear you are experience an issue. Our support team can definitely help, please contact us at support@notedapp.io and mention your iTunes username “wrenderos”. We have already made a note as highest priority. Thanks again and sorry for any inconveniences. I LOVE it !! Makes my life easier!! This app made my life a whole lot easier! Love this app. Timestamped notes save my time so much! It syncs all over my iPhone, iPad, plus Mac now :) I do not regret subscribing to this app at all. Recommend this app to anyone who needs to take note! It will be a totally new note taking experience! Thanks!!!! 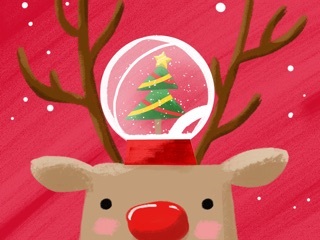 Christmasticka - Build your animated Snow Globes!